Much recent scholarship has portrayed the book of Job as sweeping away an earlier, supposedly mechanistic theology of divine reward and punishment. Joel S. Kaminsky argues that the widespread biblical notion that God rewards the righteous and punishes the wicked is more complex than often recognized. Recovering its nuances not only helps one better understand the theological outlook of books like Deuteronomy, Proverbs, and Psalms, but also helps one better grasp the debates within the book of Job. A version of the lecture was published as “Would You Impugn My Justice? A Nuanced Approach to the Hebrew Bible’s Theology of Divine Recompense” Interpretation 69.3 (2015): 299-310. Emeritus Professor David J.A. Clines (University of Sheffield) discusses the different ideas about Creation found in the Bible, criticising the tendency to homogenize these differences. He discusses Genesis 1, Job 38-41, Psalm 104, and various New Testament texts. His talk was delivered at the New Directions in Cosmology Conference, St John’s College, Durham University, January 10-11, 2013, and is available both on Vimeo and as a pdf. Professor John E. Hare, the Noah Porter Professor of Philosophical Theology at Yale Divinity School, delivers a paper on “Kant, Job and the Problem of Evil”. The paper was given on Friday March 21, 2014, at the Contemporary Moral Theory and the Problem of Evil Conference held at the University of Notre Dame on March 21-22, 2014. John Hare’s paper deals with Kant’s brief 1791 work , Uber das Misslingen alter philosophischen Versuche in der Theodicee [“On the miscarriage of all philosophical trials in theodicy‘”]. The paper begins at 10:10 in the video. Leong Seow, professor of Old Testament language and literature, Princeton Theological Seminary, presents a lecture on ethics in the Book of Job (March 19, 2009). In the history of Christian interpretation, Job has always been held up as an example of moral excellence, with the early exegetes pointing to the Prologue (chapter 1-2) and Job’s own assertions in chapters 30 and 31. This lecture explores the ethical perspectives represented in these and other important but less-noticed passages in the book. Leong Seow is the author of Job 1-21: Interpretation and Commentary (Eerdmans, 2013), a commentary that focuses on the reception history of the Book of Job. University of California Television (UCTV) provides two videos in which Prof. Bart Ehrman discusses the Bible’s explanations for suffering. Conversations host Harry Kreisler welcomes biblical scholar Bart Ehrman for a discussion of his intellectual odyssey with a focus on how the Bible explains the problem of human suffering. The conversation includes a discussion of the challenges of biblical interpretation when confronting this age old problem of the human condition. Included are topics such as the contribution of the prophets, a comparison of the old and new testaments, the book of Job, and the emergence of apocalyptic writers. The second video is a UC Berkeley Graduate Council Lecture, “God’s Problem and Human Solutions: How the Bible Explains Suffering” (2008). The discussions draw on material from Ehrman’s book, God’s Problem: How the Bible Fails to Answer Our Most Important Question – Why We Suffer (2008). 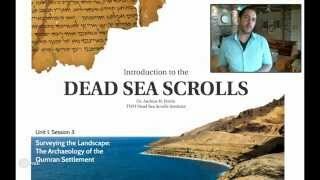 Professor Daniel Fleming, of New York University, presents an introductory course on the Old Testament/Hebrew Bible called “Ancient Israel“, which is available to view on 27 videos (on YouTube). For additional class materials, see the course page at New York University. A class taught by Dr. James F. McGrath at Butler University. The first part focuses on apocalyptic literature and the Book of Daniel as an example of this genre. The second part focuses on Judaism in the time of Jesus and the three major groups that existed in that time: Pharisees, Sadducees, and Essenes.